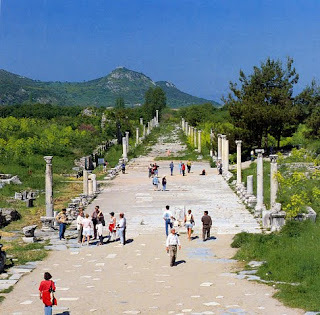 Post Cards From the Past: Ephesus: Harbor Street, Where is the Harbor? Ephesus: Harbor Street, Where is the Harbor? We ramble around the courtyard of the library. I sit on the steps for a moment, a welcome relief to feet that have been milling around for over two hours. The guide calls and the group assembles under the Gate of Mithriadates, which is on the north side of the plaza. Three stone arches embellished with intricate reliefs must have been the main gate into the city coming from the harbor side. We pass through the gates and see the great theater a hundred yards farther down the marble street. The procession of tour groups flows down the columned boulevard toward the huge theater. This is some stadium. It has a capacity of 25,000 spectators. 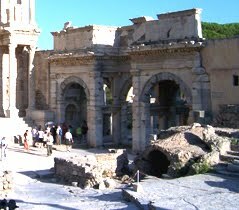 The theater was used for religious festivals, theater and gladiatorial combats. Do you remember the comment about the gladiator who committed suicide by choking on a latrine sponge rather than fighting in the arena? The must have been where he fought. St. Paul preached in this arena between gladiatorial combats. If you are going to spread the “good” word, an audience of 25,000 captive listeners is a good thing. Sadly, he got carried away denouncing paganism, Artemis and probably a few other deities. Also, I doubt he endorsed the butchery going on in the stadium before and after his sermons. Eventually, he irked enough residents that he had to flee the city. When we do an about face in front of the theater, we are looking down harbor street. This is a broad avenue lined with columns and the main thorough fair for transporting goods to and from the harbor. It is easy to imagine the hustle and bustle of pushcarts and cargo. When dignitaries like Alexander arrived, they would have disembarked their vessels and entered the city following this street. No doubt, the crowds and pageantry would have rivaled a visit from the pope. Now we look down the “”harbor” street and can see no harbor because the ocean is several miles away. How strange that even without any interference of industry that this grand city, the center of finance and religion in the ancient world fell to global cooling. 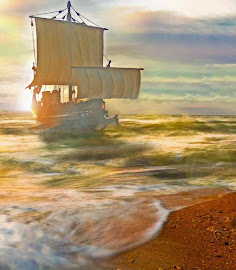 The cooler climates in the 5th and 6th century increased the size of the ice caps causing the Mediterranean ocean to recede. This is an example of what can happen without us fooling around with mother nature. Who knows? If nations cannot learn to work together, Ephesus may be harbor city once again as the ice caps melt.